Disclosure: "Affiliate links are used in this post. All opinions shared are my own." I’ve based the idea for this sauce upon a nostalgic sidedish we often ate on holidays. Poached apples with cranberry jam. So simple yet so delicious! But to be honest since I left my parents place I’ve rarely used cranberry jam in food. Time for a change. I’ve used the apples to thicken the sauce and give it an extra taste of fruitiness. Some whisky for the punch and some spices and piri piri for a subtle sting! After all this sauce will be used on a Halloween themed meal. Watch out for the Bloody Meatballs! At the end of the week they might haunt you in your dreams! If you want to cover them in this delicious spicy cranberry sauce, you can roll them in the sauce so it’s evenly spread on the top of your balls. Put them back on the grill to slighly caramellize the sauce so it sticks well! Have fun with your next session and don’t forget to tag me when you share your foodporn! The sweet and sour taste of cranberry jam. Love it! 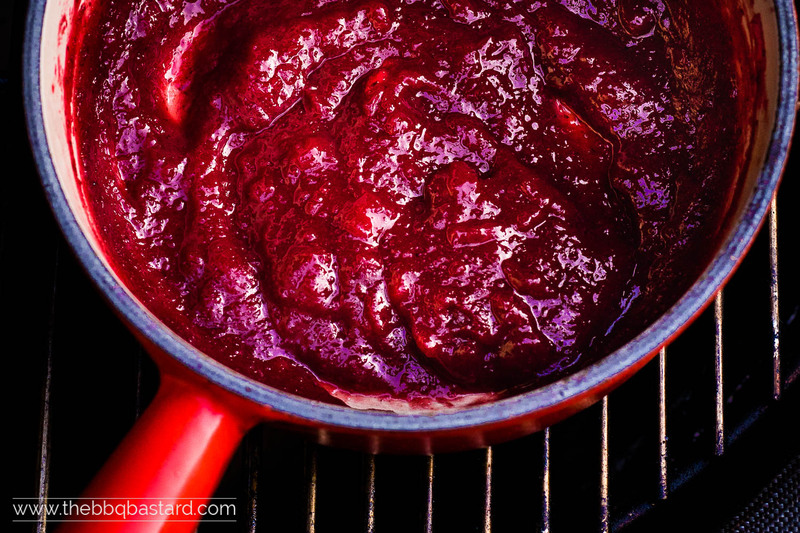 It's a perfect base for a rather untypical BBQ sauce! 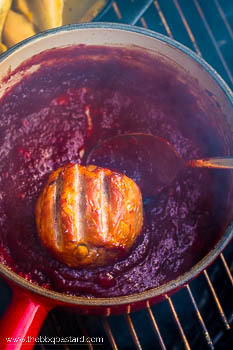 The Spicy Cranberry sauce. 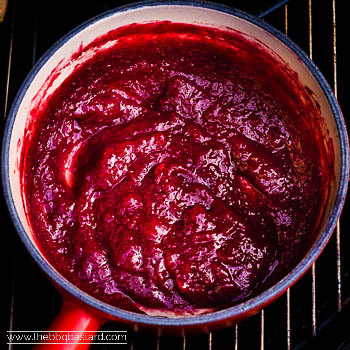 Adding a touch of heat and a sip of whisky and a couple of other flavorizers and your Cranberry Jam turns into a delicious tasting slightly spicy sauce. Delicious with a piece of game or with the Bloody Meatballs I'm about to share later this week! Stay tuned. Add some oil to a saucepan and bake the spices for a couple of minutes to release their flavors. Bake the apples until they are caramellized and soft. Gently stir them to prevent the apples from burning. Quench with whisky and add the other ingredients. Let simmer on a low heat source to reduce the sauce. Mix the Cranberry hot sauce and give it a taste. Add some more ingredients at taste. The sauce should be sweet and sour with a soubtle tangy touch. If you're not a fan of the subtle bitter taste you can add some extra salt or sugar to cover it up. I like the sauce with a subtle touch of heat. If you want more heat you can add more (or a hotter) hot sauce. Use this awesome sauce as a glaze for Game recipes or the Mighty Bloody Meatballs I'll share with you soon! Have fun! Question about the recipe: freshly grated??? You don’t list it. Is it ginger, nutmeg, ?? ?